Ref. 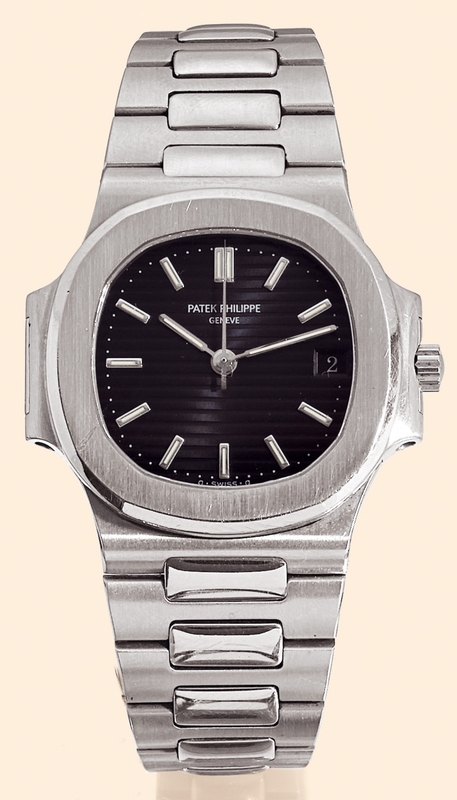 3800/1 "Nautilus" Patek Philippe, Genève, "Nautilus", No. 1426299, case No. 2843407, Ref. 3800/1. Sold on November 4th, 1987. Very fine, center-seconds, self-winding, water-resistant, stainless steel gentleman's wristwatch with date and an integrated stainless steel Patek Philippe bracelet with deployant clasp. Accompanied by a fitted box and a certificate of origin. C. Two-body, polished and brushed, sapphire crystal. D. Gray with horizontal stripes, applied tritium-coated steel indexes, aperture for the date. Tritium-coated steel ?bâton? hands. M. Cal. 335-SC, rhodium-plated, ?faussescôtes? decoration, 29 jewels, straight line lever escapement, monometallic balance adjusted to heat, cold, isochronism and five positions, shock-absorber, self-compensating flat balance spring, micrometer regulator. Dial, case and movement signed. Dim. 37 x 38 mm. Thickness 8 mm. C. Two-body, polished and brushed, sapphire crystal. D. Gray with horizontal stripes, applied tritium-coated steel indexes, aperture for the date. Tritium-coated steel bâton hands. M. Cal. 335-SC, rhodium-plated, faussescôtes decoration, 29 jewels, straight line lever escapement, monometallic balance adjusted to heat, cold, isochronism and five positions, shock-absorber, self-compensating flat balance spring, micrometer regulator. Dial, case and movement signed. Dim. 37 x 38 mm. Thickness 8 mm.